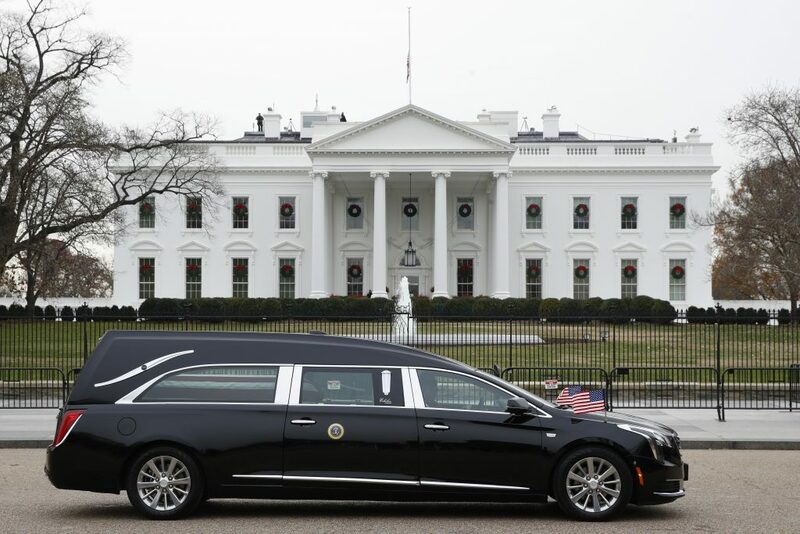 The hearse carrying the flag-draped casket of former President George H.W. Bush passes by the White House from the Capitol, heading to a State Funeral on Dec. 5, 2018. (AP Photo/Jacquelyn Martin). Former Canadian Prime Minister Brian Mulroney praised Bush as a strong world leader who helped oversee the end of the Cold War and the collapse of the Soviet Union and helped bring about the North American Free Trade Agreement with Canada and Mexico, signed into law by his successor, Clinton. Mulroney hailed the “largest and richest free trade area in the history of the world.” The three countries have agreed on a revised trade agreement pushed by Trump. 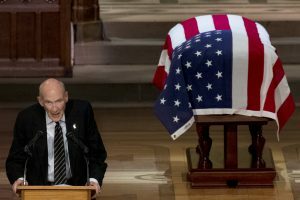 Bush will lie in repose in a church before burial at his family plot on the presidential library grounds at Texas A&M University in College Station. His final resting place will be alongside Barbara Bush, his wife of 73 years, and Robin Bush, the daughter they lost to leukemia in 1953.